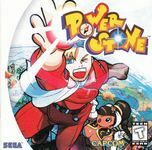 Power Stone is a no holds barred action game where anything goes. Features total interactivity - climb a pillar, lift a chair or even run up the wall. Jaw dropping graphics with fast paced gameplay! Includes eight different characters with unique abilities and fighting characteristics. Collect Power Stones to defeat your opponents - three stones will give you new abilities including the power fusion combination to blow your opponents away in just one attack. Various game modes - Play against the computer or real opponents. Hidden bonuses as you complete each stage of the game.